It is official I am a work of art. Last night I was unveiled in the Ferens gallery in Hull along with over 3000 other hardy souls, who braved the ravages of an English summer morning last year. 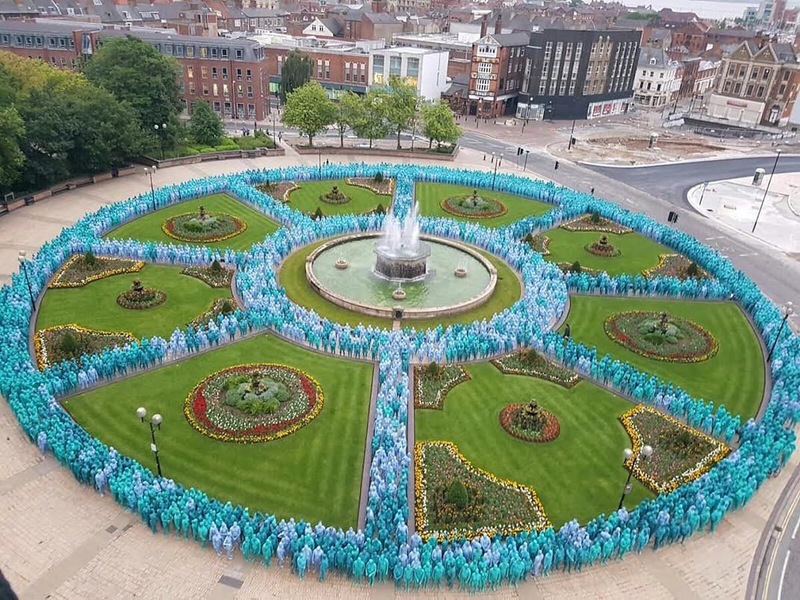 Last night whilst queuing to get in to the Ferens to witness my unveiling to the world I thought back to the original unveiling in Queens Gardens at around 5am on the 9th July 2016. I hadn’t really thought about how I would feel getting naked with so many strangers until the moment I was stood there in my undies. At that moment I was terrified, I suddenly felt very vulnerable. Then I did it I pulled them down and stood laid bare to the world. I looked up at this point and felt suddenly relaxed. 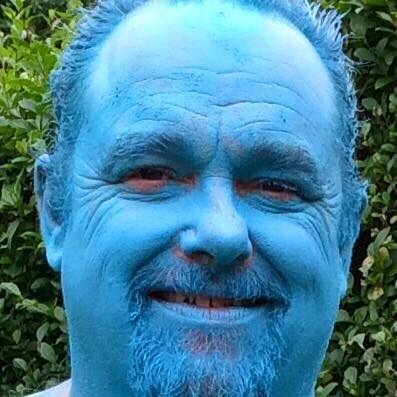 I wasn’t vulnerable, I wasn’t exposed I was with thousands of naked people in the middle of a city centre painting ourselves 4 different shades of blue. 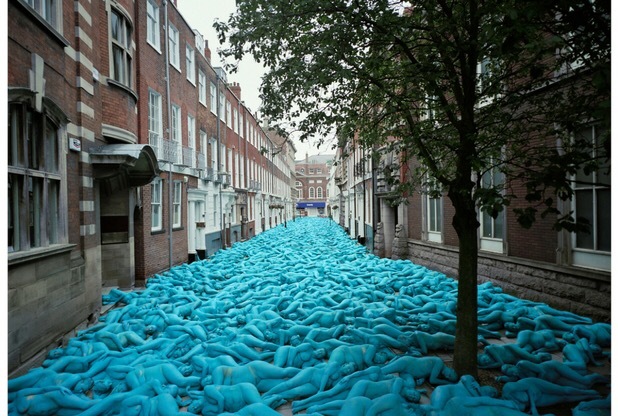 We would become in the hours to come a sea of blue naked people flooding the city. The initial awkward silence was now replaced by laughter and chatter as we asked each other if we missed a bit. Looking at thousands of people walk towards the fountain in the early morning light painted blue, was surreal. As the morning drew on the atmosphere got better and better, there was plenty of laughter and shouts of Steve! Steve was one of Spencer’s assistants who was in charge of getting us in position. Spencer was constantly shouting his name to get us inexperienced models in the right place. To 3000 plus knackered hysterical blue naked people this was hilarious so we all started shouting it. As we marched around the old town, we started to attract an audience of residents hanging out of their windows. This was most evident for those of us who went to the swing bridge over the river Hull. On the other side of the river is a hotel, where Spencer took the photo from. Every window was filled with faces as were the riverside apartments behind us. We were now being watched but it felt ok we all felt safe, we were a group, we were safe. That morning will go down as the single most liberating moment in my life. It was incredible, we were all taking part in something that will go down in the folk history of our city. We are all now a part of the cultural heritage of one of the most incredible cities in the world. I am incredibly proud of taking my underpants off in Queens Gardens. I am part of something amazing, I took part in an adventure that I will never forget. That adventure will be viewed for years to come in Ferens. If you get chance to do something outside of the usual, do it. Take yourself out of your comfort zone. Seize the moment, be amazing. If you are not from Hull, make an effort to visit us during 2017. The SKIN exhibition is on at Ferens Gallery until August, and 4 of the photographs will be kept at the gallery after that. Hull is not my hometown but I can say it is a hidden gem, and my favourite place.